Hello. 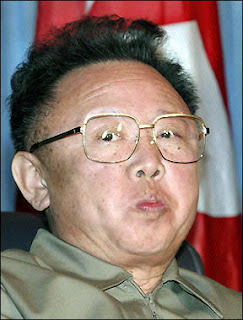 This Kim Jong Il. The fwiends who I have no yet executed call me Kimmy, but you may call me Dear Leader, Gweat General, or Supaman. Actually, I no feel so good these days. Something offy offy in my head. It not funny that my name rhyme with ill. I get tired quick, and my thingie no go up. It embarrassing. All the ladies who adore me miss my thingie. They sad, and I sad. And sometime I get so sad I have to do something to make my sadness go way, so I have the ladies use other thingies on each other, and that a make all of us happy fo little while. But it no last. I tell you mo about it later. Now I tired and I need foot bath and some hot milk of South Korean goat. They have such nice goats over there. The twaitors. May your thingies prosper (unless you capitalist aggwessor or twaitor).